With an annual production of around 50 billion m³ of gas, Nederlandse Aardolie Maatschappij BV (NAM) is the largest producer of gas in the Netherlands. Just over half of this quantity originates from the Groningen gas field, with the remainder from various smaller fields at other locations across the country (12.5 billion m³) and from the North Sea fields (11 billion m³). What began as a single platform quickly grew to form a collection of production platforms spread throughout the North Sea. Thirty years ago, the first steps were taken towards an automation process that would allow all of the platforms in the North Sea to be operated from a central control room in Den Helder. However, the processes taking place at the various platforms are so diverse in nature that a uniform solution proved to be a difficult task, and it was for this reason that the decision was taken to install a telemonitoring system, allowing the individual platforms to be monitored. In the following years, a great deal changed. Not only did the technology develop, but the number of platforms also increased. As a result, the amount of data from the field continuously increased and the telemetry system that had been chosen at the beginning could no longer be maintained effectively. A solution was found in the form of a local data concentrator. By installing this onto the existing system, the ever greater data streams became easier to manage. Ultimately, this solution was superseded by other technological developments on the market. The operational personnel and maintenance costs became too high and the risk of injury became too great, and so consequently, a new system became necessary to reduce the operational costs and to further optimize the process. Martin Dantuma of NAM's SCADA Operation Liaisons, explains: "One condition was that the operation and management of all platforms should be centralized within the NAM office in Den Helder and that better use should be made of the data coming from the field. That would make maintenance work in the field much more efficient." The solution was found in the Yokogawa FAST/TOOLS supervisory control and data acquisition (SCADA) system. The actual introduction of the SCADA system, given the name Field Wide PAS, was preceded by a lengthy process. The project is somewhat distinct from other similar projects in that the majority of production platforms differ from one another. The North Sea platforms can be roughly divided into two types: locations at which operation is fully pneumatic, and locations that are equipped with a distributed control system (DCS). In addition, these systems have been produced by different manufacturers and are from different generations. The uniform interfacing of these systems to the SCADA system was one of the most critical conditions that was set within the Field Wide PAS project. In order to make this form of interfacing possible for pneumatically operated platforms, these were equipped with a PLC-based system with limited functionality. This system ensures that signals can be transmitted from the platforms to the shore and guarantees the possibility of expansion in the future. "At all locations where a DCS had been fitted, assessment was made to determine whether or not the relevant version offered the possibility of interfacing with FAST/TOOLS. In the absence of an interfacing option, the DCS was upgraded or migrated. In total, upgrades or migrations were carried out on six Yokogawa systems and various systems from other manufacturers. The cabling already in place in the field could be preserved in the case of Yokogawa systems as only new hardware blocks needed to be connected. Commissioning in this case could therefore be carried out quickly," explains Mr. Dantuma. What was noticeable about the project was the excellent collaboration that took place. He adds: "The Field Wide PAS system is distributed across a number of locations with many suppliers involved. Despite the large number of parties that were involved in the project, everything ran smoothly. All parties worked well together, especially the technical experts from the different suppliers. The technical solutions that were developed exceeded expectations in a large number of cases." The arrival of the SCADA system increased the resolution of data and consequently, the flow of information to the shore was improved. The number of tags from DCS and SCADA increased from 200 to at least 100,000 for each location, which suggests that a greater amount of data is being used and that this data is of a more accurate nature. 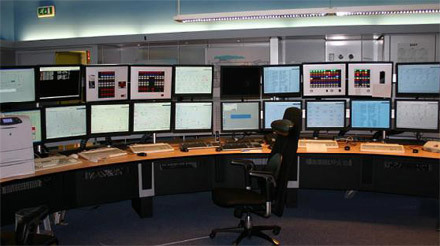 In addition, all connections between the onshore and offshore platforms are monitored continuously using the new system. "This not only simplifies infrastructure monitoring, but also ensures that it can be used more efficiently," explains Mr. Dantuma. The presentation of information is performed in Den Helder using FAST/TOOLS. "All graphics from the various DCSs are copied and simplified. By doing so, we can guarantee a uniform presentation of the information despite the high degree of variety across the DCS systems. The risk of errors has also decreased thanks to straightforward presentation," explains Mr. Dantuma. An identical system has been installed at the NAM office in Assen, alongside the system in Den Helder. This redundant installation not only provides an additional level of security, but also enables the platforms to be operated from two different locations. The signals transmitted from the various fields to the Field Wide PAS system are not used solely for operation of the platforms. As Mr. Dantuma explains: "Alongside the interface to the SCADA system, an interface to the data historian has also been installed at all locations so that the same data can be read. Coordination of both systems has taken some time to achieve, but the result is that everyone who is authorized to do so can now view the DCS system." The data is also used to the organization's advantage, for example by the Sales Department and by well and reservoir engineers. Commissioning work taking place in the middle of the North Sea is no easy task, especially when it involves more than 20 platforms. Mr. Dantuma explains: "The commissioning was dependent on the platform shutdown periods, as other activities would be taking place at this time. In order for everything to run smoothly, detailed plans were put together many months in advance. Even the SAT tests were carried out on the platform several months before commissioning took place." By making such thorough preparations, and thanks to the excellent collaboration between the different suppliers, the commissioning process ran smoothly. One part of the commissioning process is checking the tags. "You can view the DCS as an oil drum with tags," explains Mr. Dantuma. "The tags are divided into categories, to each of which we have assigned a priority. All tags with priority 1 and 2 are related to safety, the environment, and production loss, and were 100% tested. Tags with priority 3 (operational assistance) were 80% tested. Of the tags with priority 4 (no immediate action by the operator necessary), 5 (situation reports), and 6 (analog values), only the most crucial were checked." Are concrete savings being seen yet? Mr. Dantuma continues: "When it comes to maintenance, we are already seeing savings. These savings are the result of being able to monitor all platforms, in combination with the associated infrastructure. We no longer have to travel offshore for every minor event, something that was clearly not cost effective. However, there are still returns to be achieved by optimizing the process. Live checks are still carried out in this way, but it is expected that these will be transferred to a fully automated process within the near future. What is more, this project has laid the foundations for achieving savings on operational costs." Automation will be further introduced in the field. According to Mr. Dantuma: "The logic that is required in order to determine which valves are open on a platform, and which are not, will now be optimized. On top of that, we will be looking at if we are able to operate more frequently and over longer periods on an unmanned basis. A greater amount of data is available, allowing the operator on the platform to perform his/her work onshore in Den Helder, too. We can take the next step by introducing further automation to the equipment and, as a result, full control of the platforms from the shore will be within our grasp. In principle, all of the components are now in place. To add to all of this, Yokogawa now performs all of its maintenance activities from the office in Amersfoort, resulting in a much simpler maintenance process. In addition, the system itself is much more straightforward to maintain. It's simply a question of removing one card and inserting another." FAST/TOOLS is a SCADA system that is characterized by a high degree of reliability and an open architecture. The system is used for remote monitoring and management of what is taking place on a local level. The open architecture supports interfacing with a number of DCS systems. In addition to the many standard functions, additional functionality can be seamlessly integrated. The design of FAST/TOOLS is based on an open client/server architecture which supports standards such as ODBC and OPC. FAST/TOOLS is capable of operating under a variety of operating systems including Windows, HP/UX, IBM AIX, Sun Solaris, and Linux. Thanks to communication over a TCP/IP connection in a distributed environment, a variety of systems can be connected via LAN or WAN. The SCADA system can be used with a few hundred data points to over one million.